Jeffco Midget Football Association is the oldest and most respected youth football organization in the state of Colorado. Nearly 75 years ago, JMFA was organized to teach the youth of our communites the sport of Football. Since that time, the organization has grown from just a few areas to many associations across the Denver Metro area. One simple rule has always governed the organization and allowed it to grow. We are about the kids. We do not allow recruiting or team stacking, elite teams or unethical coaches. We are not perfect, but continuously hold this idea as our guiding light and pursuit of this overall philosphy has been the backbone of the longevity and success of our youth football organization. All our coaches are USA Football Heads-up Certified. The premier youth football governing body in the United States. Not only are our head coaches certified, but all our assistant coaches as well. Federal, State and Local background checks for all player contact volunteers. This includes all coaches, and team administration including managers and moms. Our practice and game facilities are locally sourced to your area. Local area organizations provide local practice fields and home game facilities. While games will be held at many locations throughout the JMFA boundaries. Carnation Bowl Games are held in local stadiums! Practices are held at convenient times for your athlete to attend. The majority of games are played on Saturdays. While some occur on Friday nights, other days are strongly avoided if at all possible. JMFA affiliate associations have fantastic player retention numbers. Why is this important? Players continue and conversely, discontinue playing a sport for many reasons. Our teams promote Good Sportsmanship, Fair Play, Teamwork, and Self Respect, along with Respect of others. JMFA teams are all volunteers. Parents need not fear a huge commitment of volunteer time, unless they choose to. Of course you may be asked to help out on occasion to hold down markers or help with refreshments. JMFA parents and players are not required to pay large amounts of money to play. Other than registration fees, which vary by area but are always reasonable, you may have equipment and uniforms to buy. We are not club teams that require heavy travel or tournament fees to play. Coaches will not "require" players to take personal lessons with them or to attend expensive camps. Players are welcomed and even encouraged to attend local camps in their area, but it is never mandatory. Many JMFA areas are associated with one or more local high schools. In fact, much of the borders for area player participation are set based on high school articulation areas. Check with your local area associations to see what their affiliation is with the local HS. Many offer local skills camps and other fun activities to familiarize the player with the game as well as to introduce them to their great schools. JMFA offers various levels of play. This is in line with the USAFootball governing body. 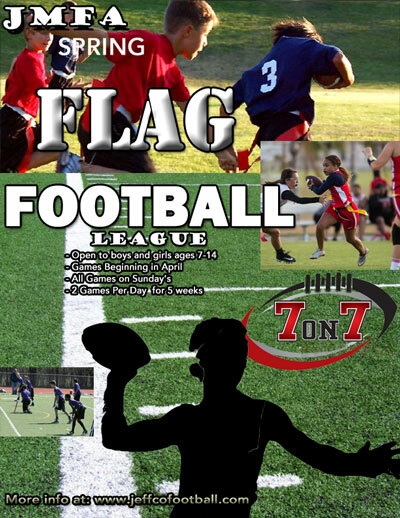 In fact, JMFA was part of the pilot program and the first in the Rocky Mountain region to install the newest version of tackle football called Rookie Tackle. Rookie Tackle (modified version of the tackle game) [Fall]. Great for those starting out and not quite sure if they are ready for the full tackle version of the game. All players are required to play(minimum play rule). 8 Game season, with playoffs and a championship. New this year! Pool play. Essentially a mechanism to pair teams up for season play based on their competitive level. Why is this important? This new modification to the bracketing and scheduling of teams allows teams to be better matched up against similar skill levels. Metro area league. JMFA has areas associations ranging from the as far north as Brighton, east as Green Valley Ranch, south as Englewood, and west as Evergreen/Conifer. Teams from all of these areas and everywhere in between play. This makes for fun traveling to these other cities to play or them coming to your city. No cross state border tournaments, or Colorado Springs to Ft. Collins commutes! They are all in the Denver metro area. There are a lot of programs to choose from. We hope you will see why we are the best in the Colorado region and choose to place your child in one of our area associations and to become a part of the best organization in the state. No Flag Games - Mothers Day!